Half pallet UPAL-D 800x600x150 mm | George Utz Ltd. The UPAL-D are display pallets with the standard dimensions of 800x600 mm. The fully enclosed version is suitable for universal use; Containers of different sizes can be stored and transported on the pallet as well as component holders. This plastic pallet has a smooth, closed top deck and 3 runners. 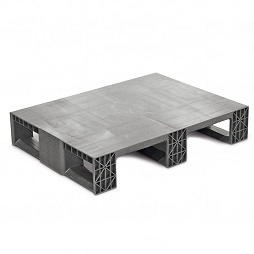 The standard lead time for this pallet would be 2-3 weeks from receipt of order.